Are you inspired by large scale fabric prints? After my visit to Frond Design Studios (read my blog post here), I sure was! This Art Weave class is an answer for using these beautiful, large scale designs in a fun, easy project. 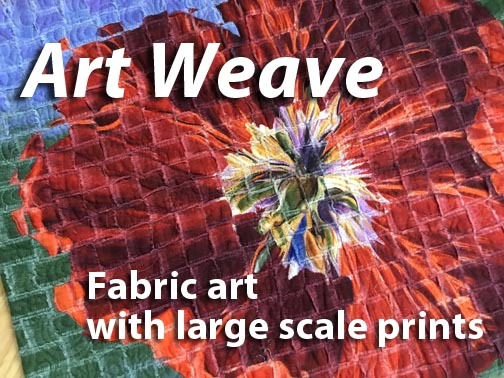 Art Weave: Fabric art with large scale prints from Frond Design. I'll be teaching the Art Weave class at the Ringgold Quilt Expo, August 24-26, 2017. Join me! Contact the City of Ringgold for class registration. Contact Kathy at It's Sew Time at (706) 937-3777 for quilt show details. Let's make fabric art together with beautiful, large scale, artisan fabric designs!